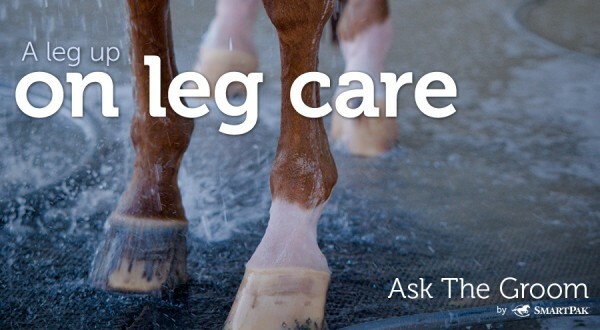 Knowing your horse’s legs inside and out is paramount when looking after any horse. Daily checking of legs should be undertaken so that any abnormalities, from the slightest boot rub to a large laceration can be detected quickly and any further issues be put at bay by dealing with the injury correctly. Assuming all is normal, legs are curried and brushed. Boots or polos are used for exercise. 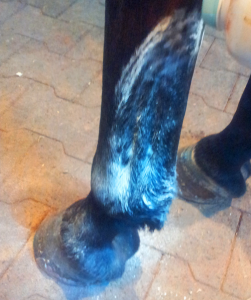 After exercise, if legs are dry, they are checked for any boot rubs and abnormalities, if all ok they are then brushed. Should the legs be dirty then they get washed and toweled dry. I do not daily shampoo legs as I feel this strips the natural qualities from the skin. However if some sort of skin issue has occurred, for example fungus, then legs would be washed with either one of the following….. Anytime a horse can hand graze dry before being returned to the stall is the best option. The quicker the legs become dry, there is less time for an environment to materialize that’s conducive to fungus! After a jump school, I use some form of tightening product to massage into the tendons. Sore No More is my favorite, however a less expensive product such as witch hazel can be effective also. Intermediate and advanced horses get standing wraps on front legs whilst in their stalls. Once I have put on the liniment I then shake on some baby powder. This helps to dry the leg a little under the wrap, helping avoid skin irritation or fungal growth. If horse is on night turnout the standing wraps come off. After a gallop, horses front legs are iced for 30 mins. There are many ways to ice, for me personally the most effective way are the whirlpool boots (I do not use the motor). If the horse dislikes these, I will then use tubi grip, placing the ice in between the folded stocking. I will then secure it in place with a polo wrap. After icing, legs are dried, checked for any obvious abnormalities, poulticed with up tite clay poultice and then wrapped. Obviously this is only scratching the surface on leg care. There are many leg issues that need to be handled in different ways. If in doubt call your vet. Feel free to ask me a question if you have a specific issue on leg care! Great article. Thanks so much for sharing! between the clay and the wrap? Hi leslie, thank you for reading my blog. I always use wet paper on top of the clay poultice. I feel this helps to draw heat away from the leg allowing the poultice to dry. I know a lot of racing people use Saran wrap, this technique is not uncommon, however in my experience, you want the poultice to dry, keeping it moist does not help to tighten the leg. Like I say this is only my experience, ask a racing professional and I am sure they will explain their reasons for using plastic. Thank you very much Emma! This makes complete sense! I have used Saran wrap a few times and I felt as though it kept the legs hot. I will try paper, next time! Thank you for all your great advice! I jump about 2’3″-2’9″ twice a week, normally I cool my horse off and then I wash him off with cool water and then I bathe him in Absorbine Freshmint wash. After he is air-dried I apply liniment to all four legs starting at wear his legs meet his body working my way down. Am I doing enough or should I be doing something differnetly? Hi P. I think what you are doing for you horse is great. I can honestly say I only concentrate on the lower legs when rubbing in liniment, however there is no harm in working on the upper leg muscles if you have time… Hope your horse knows how lucky he is! The only reason to change your leg care routine would be if you notice changes in the tightness of his legs, start to see skin irritation or if you were to start jumping large jumps (3’6″ +) on a regular basis. Thank you for your question. This may seem a bit trivial, but my OTTB has very thin skin and gets rubs like no other. He tends to overreach so he has bell boots on when he’s not in his stall. I have started to notice small boot rubs on each side of the leg that aren’t going away without a fight. How do you recommend treating them? And how can I prevent further boot rubs in the future?